Few things are more satisfying (to me) than finding and using a gadget that makes an annoying chore easier or faster. 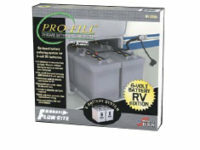 We all know we need to regularly add distilled water to our RV batteries to keep them healthy, but the job is often such a hassle that we tend to put it off. Well, procrastinate no more! A remote battery ﬁlling system will allow you to actually enjoy the task. I have been using the remote-ﬁll systems from Flo-Rite on my RVs for a number of years, and they are simple, reliable and easy to install. 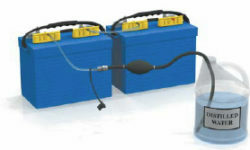 Depending on the battery type, the ﬁller caps or covers on the battery are replaced with small ﬂoat valves that actually sense the level of electrolyte in each battery cell. All you need do is stick the systems inlet hose into a gallon of distilled water and squeeze the small hand pump to add water to all of the battery cells at once. The ﬂoat valve in each cell will allow water in until the correct level is reached and then automatically shut off the ﬂow. Once all of the cells are full, you are done until next time. While these systems are a great accessory for all RVs, they really shine in RVs where the battery bank is hard to reach or inaccessible. Once the system is installed, you no longer need access to the top of the batteries to add water. You don’t even need to be able to see them! The systems come in two styles. The Qwik-Fill system is designed for one or two 12-volt, deepcycle batteries, and the Pro-Fill RV Edition is for two 6-volt golf cart batteries. Each system can be expanded to handle a larger number of batteries. Complete systems and parts can be purchased from Camping World, either online at http://www.campingworld.com or at any retail store.